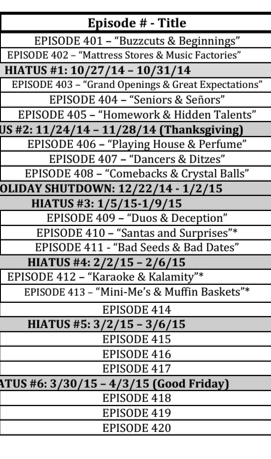 "Dancers & Ditzes" is the 10th episode in Season 4 of Austin & Ally. It was the seventh episode filmed of the season.. It premiered on July 12, 2015, featuring Becky G as part of the guest cast. The episode's premiere earned 2.2 million views. Ally is performing at an awards show but the producers are worried about her dancing abilities. Austin, Ally, and Dez are sitting in the lobby of the A&A Music Factory, where Austin is planning an event for his anniversary with Ally, much to Dez's chagrin. Suddenly, Trish walks in and announces that she booked Ally to make a presentation and perform at the next Miami Video Music Awards. The three of them urge her to make it something elaborate, mentioning a routine where Katy Perry did the splits over a rhinoceros, while the rhino did one over an elephant. Dez claims that such a feat isn't that hard, but finds out otherwise, and his discovery is made worse, when Trish tries to force him to do it anyway. Austin and Dez's recommendations for an over the top show are a little life threatening. After the theme song, Austin and Dez suggest stunts where she evades lions and sharks as part of her performance, but she turns both of their suggestions down. Carrie who now works in a smoothie shop at the mall has a modeling gig scheduled in Los Angeles, and is upset that she'll have to leave Dez behind. Dez urges her to take a job as a trophy presenter at the MVMA's, but Ally doubts they'll hire her right away. When Dez starts crying over her potential absence, Trish steps in and offers to talk the producers of the show into giving her a job. The dimwitted couple are now elated, and Dez tells Carrie that all she has to do is look pretty and hand people their awards. Unfortunately, she practices with smoothies, and keeps dropping them. At the arena where the awards are being held, Trish is more than anxious to get Carrie the gig in order to keep Dez from hanging out with her while she's in L.A. The producer, Sheila Berman, chooses her over two other girls, and Carrie reveals that she used glue during the audition. Trish and Dez remind her that she'll have to do otherwise when she gives the awards to the winners on the night of the show. Just then Austin and Ally walk in, and Ally tells the producer about the type of show she's going to perform, but the woman refuses to let her do what she planned, because she's only known for her bad dance routine in the music video for "The Ally Way." Sheila insists Ally should just sit at the piano and sing, but Ally wants to use her time there to show the world that she's more than just "the Ally Way Girl." After some coercing from Trish and Austin, she finally agrees to let her do what she wants on stage. Later we see a montage of Austin trying to teach Ally how to dance, and Dez trying to teach Carrie how to carry a trophy during a ten foot walk. Eventually, Carrie is able to succeed at presenting awards, and gives Ally one of the fake awards that Dez bought after Ally shows them her dance routine. Once she receives the "award" she decides to go into another room, and Trish and Dez are convinced she won't be ready for the show. Both argue over which of the two are going to convince her to bow out, and realize they have to find a more elaborate way to get her to just sit and perform at the piano. Austin and Dez walk in to find Ally in a yoga pose trying to decompress before her show. Just then, Trish walks in and announces that Sheila cancelled her planned performance. Ally decides to call the producer to find out why she cancelled the performance, only to find out Trish told her that she had cancelled it herself. Austin and Trish try to explain that they didn't want Ally to embarrass herself on stage, and Ally walks away infuriated over their lack of confidence in her. Dez claims they should've been more direct with her. On the night of the show, Dez thanks Trish for getting Carrie the gig, but criticizes her for how she treated Ally. Austin walks over with flowers that he was originally planning to bring to Ally's dressing room, but Ally locked everybody out. Knowing this, he offers them to Dez, who unexpectedly gives them to Carrie before she's about to hand out her first award. Will Ally just sit and sing at the piano like she was told? NOT A CHANCE! On stage, Jett Deely announces the winner of some award involving a performance with a wild animal to Chandelier Baker. After she finally gives Miss Baker her award, she tries to steal the spotlight for herself. Jett soon announces Ally, who sits at the piano performing the song "Dance Like Nobody's Watching," while extras act like paparazzi photographers surrounding the piano. These extras turn out to be backup dancers who's dance routine she joins just before the chorus to her song. Much to everybody's surprise, especially Austin and Trish, Ally's dance routine turned out to be good, and it goes off without a hitch, other than the one that was attached to the cable designed to help her "float" on stage, which her backup dancers hooked and unhooked at selected moments during her performance. After her performance, Ally goes backstage and meets Becky G, who's impressed with her routine. Like many others, she incorrectly assumed Ally would do another rehash of "The Ally Way." Becky goes on stage herself, and the rest of Team Austin approaches her to congratulate her, but she's still upset with them for not believing in her. Both apologize to her, and they reconcile. Meanwhile the final award for the most epic music video is announced, and the winner turns out to be a ten member country and western group named "Marshall Frumpkin and the Frumpkin Family Singers." Realizing she may have to carry all ten trophies, Carrie panics, until Dez offers to carry her with the trophies on stage. Jett reminds her that all she had to do was bring them on the cart at ones. Becky G closes out the show by performing her hit "Can't Stop Dancin'." The day after the show Ally's MVMA performance becomes the number one viral video surpassing a video of a sneezing panda bear, only to be surpassed by a video of the sneezing panda's baby who turns out to have inherited whatever allergic condition cause him or her to sneeze. The team watches the video and gushes over how cute the baby bear is. The cast had the table read of this episode on December 8, 2014. This episode began filming on December 11, 2014. Becky G guest stars and performs her song "Can't Stop Dancing." This episode is very similar to Viral Videos & Very Bad Dancing as Ally is again told her dancing is not good but Ally still takes pride in it and disregards what everyone else thinks. This episode marks the last appearance of Jett Deely. We find out Ally's birthday is November 29, which is also Laura's birthday. In this episode we first real see the dance studio in the Music Factory, without counting previous episode, because it had been transformed to a manager office (Mini-Me's & Muffin Baskets). This episode earned 2.245 million views. This episode aired in Australia, September 18, 2015. Due to the new show "Best Friends Whenever" and "K.C Undercover" taking Austin & Ally's time slot, this episode aired at 9/8c. This episode features Ally's third original song in season 4, "Dance Like Nobody's Watching." To view the Dancers & Ditzes gallery, click here.